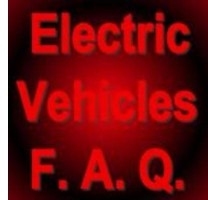 Frequently asked questions about electric cars and other electric vehicles. 1. Are electric cars expensive? 2. Is it hard to travel long distance with electric cars? 3. Are electric vehicles slow? 4. Does it take all night to recharge electric vehicles? 5. Do electric cars need to be recharged frequently when traveling long distances? 6. Electric Vehicles - where can I buy them? 7. Will there be enough lithium? 8. Won't replacing all existing cars with new electric cars cause a lot of pollution? 9. If most electricity for the EV comes from coal-fired power plants, than isn't diesel cleaner? 10. Isn't driving a car on renewable biofuel just as clean? 11. Are electric vehicles safe? 12. Do batteries make EVs more heavy? Do they take space? 13. Is there government support for EVs? 14. Do batteries lose their ability to fully recharge over time? 15. Is there a risk that Lithium-ion batteries will explode or catch fire due to overheating? 16. Can the power grid cope with the extra demand from EVs? 17. Are electric cars convenient? 18. Are electric cars merely a novelty that will go away? the price even further, to US$20,280. Check for current incentive details! In the US, the LEAF (pictured right) is also available for lease, for US$349/month, for 36 months after an initial US$1,999 payment. 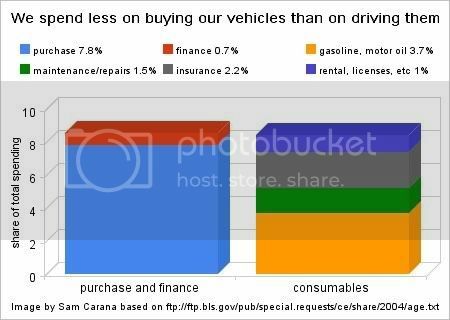 Furthermore, electricity is cheaper than gasoline, while an electric vehicle can also be expected to require less servicing, as it has less moving parts and less mechanical complexity than a traditional gasoline-powered car. The Subaru Stella, which has been on sale in Japan since July 2009, can travel up to 90km (56 miles) on a single charge of its 9kWh Lithium-ion battery, which can be charged in 8 hours with an AC100V household power outlet or in 5 hours with an AC200V outlet. The price of the Stella is 4,725,000 yen ($56,646 at Oct.11, 2009), which includes consumption tax. It has been approved by the Japanese “Next Generation Vehicle Promotion Center”, which makes it eligible for a subsidy of up to 1,380,000 yen ($15,376 at Oct.11, 2009). Additional tax reduction can also be expected due to special measures conducted by Japanese Ministry of Land, Infrastructure, Transport and Tourism. The Mitsubishi i-MiEV Electric Minivan (pictured below) is on sale in Japan with a price tag of 4,599,000 yen (incl consumption tax), while the above subsidy of 1,380,000 yen can bring the price down to 3,219,000 yen ($35,866 at Oct.11, 2009). The iMiev is scheduled for sale in the U.S. in 2010 for under US$30,000 and that's the price before credits and rebates are taken off, so some customers may end up paying under US$17,500. Mitsubishi expects to distribute some 1,400 i-MiEV models in fiscal 2009 on a maintenance lease basis, mainly to corporations and local authorities. Mitsubishi plans to start sales of i-MiEV to individuals in April 2010 and will start taking orders from next month. Mitsubishi quotes research showing that the vast majority of cars in Japan are driven for less than 60 km (about 37 miles) daily. The i-MiEV will have a 16 kWh battery, giving the i-MiEV a range of up to 160 km (about 100 miles) on a single charge. The more capacity the battery pack has, the longer a full recharge will take. A full charge will take some 7 hours from a 200-volt domestic outlet, or 14 hours from a 100-volt outlet, using the cables supplied with the vehicle, while a "quick charge" (to 80% of its capacity) will take some 30 minutes at quick-charge stations that are currently being established throughout Japan. The purchase price of electric cars still is high, partly due to battery cost. The Nissan Leaf’s 24kWh lithium-ion battery reportedly costs £6,000 (US$8,880 as at May 9, 2010) to produce. While battery cost is set to fall over the years, one could already get around the relatively high initial cost by using a small battery for daily usage, while using (rapid) recharging and battery switching stations, such as envisaged by Better Place, on days that one needed to travel longer distances. Leasing a larger battery only on days that this is needed can significantly lower the purchase price of an EV. The Renault Fluence Z.E. comes with a QuickDrop battery switching system that enables battery swapping in about three minutes at bespoke switching stations. Battery swapping stations and rapid recharging points are now being planned or have already been built in many places around the world. At its Tokyo battery swap station Better Place demonstrated it can do a switch automatically in less than 60 seconds. The battery packs in electric cars could power homes, e.g. in cases of emergency, while one could also make money with the battery through V2G (vehicle to grid), which could earn owners of EVs $1,500 a year according to U.S. power grid chief Jon Wellinghoff. Also, there's a growing aftermarket for lithium-ion batteries, making it attractive to trade a battery in for a new one while getting a good price for the old one, which partly compensates for the currently high upfront cost of batteries. EV prices are also high due to low volumes, which could change rapidly. With further innovation, mass production and economies of scale, electric cars can be expected to become cheaper than gasoline cars, since electric cars have less parts; the motors can be in the wheels, so there's no need for a differential, axle, or shaft. There is no need for a gearbox. There's no need for a starter motor, alternator and the traditional battery of gasoline cars. The Michelin active Wheel has a built-in motor to drive the wheel, as well as a motor to manage suspension. This means there is no need for suspension in the body of the car. Also, there's no need for an air filter, air intake manifold, fuel lines, fuel filters, fuel pumps, carburetors (or fuel injection system), water pump, coolant pipes, radiator, fans, motor oil tank, alternator and all kinds of sensors and management devices to monitor and control all this. Apart from the purchase price, cost of driving a car is an important consideration. Not having all those parts also means there's no need for maintenance on them, i.e. regular checks, servicing, adjustments, repairs and replacements. Electric cars don't need a regular smog check, change of oil and lubricants, filters, gaskets, hoses, spark plugs, timing belts, clutches, automatic transmissions, fuel pumps, there's no catalytic converter or exhaust system to replace. There's not the vibration of gasoline cars causing wear and tear, nor the heat, so often there's no need for a radiator to cool things down. Brushless motors have little or no parts that need replacement due to wear and tear by friction. Using the motors to brake or slow down the vehicle means there's less stress on the brakes, which means the brakes can last for the lifetime of the vehicle, without need for replacement. At some stage in the not-too-distant future, as electric cars will start outselling gasoline cars, economies of scale will start working against gasoline cars. It's not just that new gasoline cars will be more expensive with falling production numbers, the parts for maintenance of gasoline cars will also become increasingly expensive. The engine and associated components account for as much as 40% of a typical car’s total parts. As the number of gasoline cars falls, there will also be fewer and fewer suppliers, mechanics and service stations to refuel, repair and service these gasoline cars, driving up prices of components and gasoline, while further regulations will be introduced to reflect environmental harm. And of course, one could convert an existing car, rather than buy a new one. Read this story in Suburban Journals about how Ron Erb's brother-in-law had a Ford Ranger that had just stopped running, but the body was still in good condition. Ron converted the truck into an electric vehicle for $7,700. A rebate program offered by the state of Illinois, called Green Fleets, gives rebates of up to 80% of the conversion cost up to $4,000. So it looks like he's got an electric vehicle for about $3,500. Furthermore, he may have tax advantages and he'll make savings on the cost of driving and on maintenance, so he'll practically have a good, clean truck for free. If you like that story, have a look at EV album where you can click on a car and see what they've done, how much it did cost and all kinds of details. I can see a huge cottage industry developing around conversion. The range of electric vehicles depends on what battery pack they have. The Tesla Model S offers three battery pack options with a range of 160, 230 or 300 miles per charge. Range will also depend on whether you're driving in the city or on the highway, and on your driving style. The Tesla Roadster has a range of about 220 miles, according to Tesla specs. Yet, on October 28, 2009, on the fourth day of the 3000km Global Green Challenge from Darwin to Adelaide, Internode founder Simon Hackett and co-driver Emilis Prelgauskas drove a Tesla Roadster over a distance of 501 kilometres (313 miles) on a single charge. The car still had about 4.8km (three miles) of range left when the drive was completed. A full charge can give the Nissan LEAF a driving range of more than 100 miles (160km). Long-distance travel with electric cars becomes easier with the appearance of more recharging points on highways and further innovation. When planning a trip, the Nissan LEAF's navigation system can tell you how much electricity is likely needed, how much the battery has got and where you can charge on the way. A quick charger (three phase, 200 V) can charge the Nissan LEAF's battery pack up to 80% capacity in less than 30 minutes, or give the LEAF an extra 50 km (31 miles) worth of range in about 10 minutes. The LEAF can also send you messages, e.g. if you're shopping the Leaf can text you that it is 80% charged and ready for your trip home. The Mitsubishu iMiEV has a similar range (up to 160 km or about 100 miles on a single charge -- it has a 16 kWh battery but is lighter than the LEAF). According to a report at Crunchgear, Japanese company JFE Engineering has developed a charger that can give the iMiev a 50% charge in just three minutes, or a 70% charge in five minutes. In tests JFE conducted, the iMiEV was able to drive for 50 miles (80km) continuously after a 5-minute charge. Battery capacity is still expensive. Therefore, buying a smaller battery for now will make an EV a lot more affordable, and this will suffice for most daily usage, as most people live less than 10 miles away from their work and their car is used for only a short time during the day. Households with two cars can use an all-electric car for city driving, while using another car (e.g. a plug-in hybrid like the Volt or a fuel cell car like Honda's Clarity) for the occasional long-distance travel. Recharging can take place several times a day, firstly during the night at home, but also while the car is parked at the place of work, at the mall, or during travel as more recharging points become available. One doesn't have to wait for the battery pack to be fully recharged, a partly recharged battery pack may well suffice to make the trip back home. 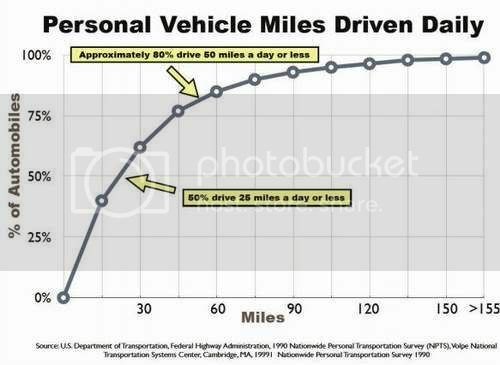 Many people rarely travel long distances, some 80% of cars are driven for 50 miles or less daily. For the occasional long-distance travel, an alternative that also makes sense is to use high speed rail, possibly enhanced by MotoRail or use of EV rental, taxis and light rail at the destination. Alternatively, it also makes sense to buy an electric vehicle with a small battery and go to a battery swapping station to swap it for a larger-capacity battery on the odd day that one needs to travel interstate. This bigger battery may still require recharging or swapping repeatedly during extensive travel, but battery switching stations and rapid chargers can do this in a matter of minutes. When returning to one's hometown, one then swaps back to a smaller (and cheaper) battery. This approach is followed by Better Place. Alternatively, one could also rent a car with a large battery capacity for long distance travel. Battery technology is rapidly improving, with huge amounts of money going into research and development of batteries with higher capacity. In early 2008, CNET reported how researchers used silicon nanowires to give rechargeable lithium ion batteries a tenfold improvement in battery life. The study can be found at Nature. Battery provider Southern California Edison (SCE) has demonstrated a lithium ion battery with a lifespan of more than 180,000 miles. Since the average family car travels about 10,000 to 15,000 miles each year, the battery could last a decade before it needed replacing. Prices will come down with such innovation and with mass manufacturing and economies of scale. Therefore, many expect that within a few years, large capacity batteries will be available at low prices. You may be surprised about the acceleration of electric cars. Who do you think did win the race below, the Corvette or the 1972 Datsun 1200 with electric motor and batteries? Clue: The Datsun can do 0-60 mph in 2.9 seconds. Also note the KillaCyle electric bike. It can do 0-60 mph in under 1 second, can do the quarter mile in 7.89 seconds and can reach a speed of 174.05 mph. It used only around $0.07 worth of electricity for each run. The Tesla Roadster Sport has faster acceleration than most other cars, from zero to 60 mph in 3.7 seconds. Some electric cars may be slow at times, as they have only a small battery, but this could be improved by adding capacitors. The fact that electric cars make less noise doesn't mean they are slower. In the electric Hi-Pa Drive™ Ford F-150, four in-wheel motors are used each weighing 66-lb and each delivering over 150 lb-ft of torque directly to the wheel, at any speed. Together, these motors deliver 600 combined horsepower and 2,000 lb-ft of cumulative torque at the wheels — more horsepower and torque than the 320-hp 5.4L V8 in the original F-150 truck. The top speed of many electric vehicles is electronically limited to to comply with road regulations. In Japan there's a 62 mph (100 km/h) speed limit, so that's the top speed mentioned for cars like the Subaru Stella, currently for sale in Japan. It actually could quite easily go a lot faster than that. The Tesla Roadster's top speed is electronically limited to 125 mph. The Tesla S will have an electronically limited top speed of 130 mph. Acceleration from zero to 60 mph is 5.6 seconds, while sport versions are expected to achieve 0-60 mph acceleration well below five seconds. It has a 300 mile range, a 45 minute QuickCharge, a single-speed gearbox and seats 7 people (five adults and two children). It depends on what battery one has and what electricity outlet is used for recharging. 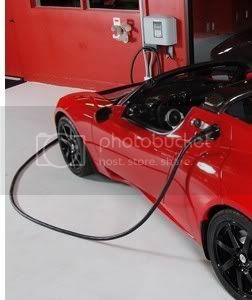 Fully recharging the Tesla Roadster – from empty to full – can be done with the $3000 Home Connector (pictured right) in 3.5 hours at max power (16.8 kW, single phase 240V at 70A). While factory specs give the Tesla a range of 244 miles, much depends on driving style and conditions - a Tesla once drove over 313 miles on a single charge. Recharging the Tesla from a Home Connector for just one hour will give the car a range of well over 50 miles - sufficient for most daily driving. Tesla also provides a collection of mobile connectors that allow top-up recharging from any power outlet, at rates of 5 miles range per hour up to 32 miles range per hour at max power, depending on the outlet. The Tesla model S costs about $4 to fully charge. You can charge it from any outlet. With QuickCharge, Model S can charge to 80% of capacity in 45 minutes. Standard charging times will vary depending on battery capacity, ranging from approximately 3 to 5 hours. Alternatively, you can apply a 5 minute battery swap. Three battery pack options offer a range of 160, 230 or 300 miles per charge. The Model S battery will have a useful life of 5 to 7 years, while proper care can result in a 10-year life. Prices for the Model S are expected to start at $49,900, after a $7,500 federal tax credit. Deliveries of the Signature Series Model S will begin at the end of 2011 with deliveries of the standard model beginning in early 2012. The larger the battery capacity, the longer it will take to fully charge the battery. To fully recharge the battery from empty for the iMiev will take some 7 hours from a 200-volt domestic outlet, or 14 hours from a 100-volt outlet, using the cables supplied with the vehicle. That will give the iMiev a range of160 km (about 100 miles). But the battery can also be part-charged, and part-charging will suffice in many cases. 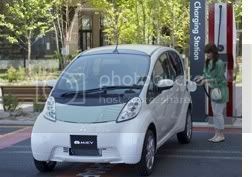 A "quick charge" (to 80% of its capacity) will take some 30 minutes at quick-charge stations that are currently being established throughout Japan. The Subaru Stella, also on sale in Japan, has a smaller battery and will drive up to 90km (56 miles) on a single charge. The 9kWh Lithium-ion battery can be charged in 8 hours with an AC100V household power outlet or in 5 hours with an AC200V outlet. Charging up to 80% of its capacity can also take place in 15 minutes with a quick-charging system. New Scientist described all this years ago in an article called Charge a battery in just six minutes. Here are some technical details, from a Altairnano presentation dating back to 2006. Altairnano envisages 440V to 480V rapid charging stations (1000A), at locations such as service stations and parking meters. To cope with rapid recharging, the electricity could be supplied by numerous grid-connected cars selling surplus electricity that they got from the grid earlier, at cheaper rates and over a period of several hours during the night, using standard household connections. According to this document, the Altairnano has demonstrated that their NanoSafe cell can be charged to over 80% charge capacity in about one minute. According to a May 4 2010 report in the Nikkei Japanese subscription news service, Yokohama-based JFE Engineering Corp. has developed a charging system that can give an EV battery pack a 50% recharge in three minutes. The system is scheduled to go on sale in 2010 and will cost 6 million yen ($63,380), or 40% less than existing products, to install. Software changes and other adjustments to the car itself are needed to use JFE's charger at full speed, the company says. Without them, the charger will work only as fast as existing products, according to Green Car Advisor's report on this topic. With further innovation, mass production and the associated economies of scale, batteries will improve in this respect as well. MIT researchers have managed to dramatically reduce the time it takes to recharge lithium ion batteries. GM-Volt.com gave the story the title a 100-Fold Lithium-ion Battery Breakthrough. If one has a car with a small battery, recharging will have to be done multiple times when traveling long distances. France is planning EV rentals as the next step up from the public electric bicycle hire system that's very popular in Paris and some other cities. In the odd case that one needed to travel long distances, one could use a hired electric vehicle. Better Place envisages people using a cheaper battery for their urban use, while turning to a battery swapping station to put in a battery with a larger capacity on the odd days that one wanted to travel to another city. Then, when returning to one's home town, the battery is swapped back for a cheaper battery. One would only need to swap the battery once or twice during one's travel between cities, or recharge the battery with a rapid charger at service stations or at night from a standard domestic power outlet. The cost would be similar to what one now pays for gasoline and maintenance associated with such travel. In the US, the Tesla Roadster has been for sale for some time, while the Subaru Stella and the Mitsubishi iMiev are for sale in Japan. The Nissan LEAF is slated to be introduced around the world next year. The Reva is for sale in India and Europe. Most car manufacturers are working on getting electric cars ready for sale within one or two years. GM's Volt is also slated for a 2010 launch. Ford plans to launch a battery electric commercial van in 2010 and is investing $550 million in a plant to produce the Ford Focus (launch 2010) and a battery-electric version of the Focus Focus (launch 2011). Chrysler is working on four EVs, one of which will be for sale in 2010. Norway’s electric car maker, Think, plans to open a manufacturing plant and technical center in the United States. The plant will build the THI!NK city, an all-electric car that can travel up to 112 miles on a single charge. The Think City is a two-seater with an optional back seat. The City for the European market has a top speed of 62 mph, a range of 112 miles and its batteries need several hours to recharge. Think's goal is to produce a car priced at less than $20,000 with a $90 monthly lease for the batteries, according to a report in The Detroit News. The new TH!NK city has a top speed of 62 mph. Before offering the car to American consumers, Think aims to increase top speed to 70 or 75 mph and to further improve driving range and acceleration, reportsAutoweek. Of course, there's also the option of converting an existing car. Virtually all car batteries in the U.S. are recycled and I imagine the same will occur with lithium-ion car batteries. Recycling could be encouraged by imposing a deposit fee, to be returned when the battery is disposed of at a collection point. According to the U.S. Geological Survey, Bolivia has 5.4 million tons of lithium, Chile 3 million, China 1.1 million and the U.S. 410,000. However, according to other sources, such as Western Lithium, it is likely that millions of tons of lithium can be mined in the US alone. A 24kWh battery for the Leaf EV will use 4kg of lithium (metal equivalent), so 1 million tons of lithium would suffice for 250 million vehicles, or approximately the number of motor vehicles registered in the US in 2007 (Department of Transportation data for cars, trucks and buses). Seawater, according to the Institute of Ocean Energy, Saga University, Japan, contains some 230 billion tons of lithium, at concentrations of 0.1 to 0.2 ppm. While it may now be cheaper to mine lithium in South America, recovery from seawater could be attractive when combined with desalination, as discussed in Four Cycles of a Sustainable Economy and when using surplus energy, e.g. as discussed in CETO wave power. Moreover, there are a number of alternative types of batteries that don't use lithium. In conclusion, this issue isn't something to further worry about. Cars need to be replaced over time anyway, so replacing new cars with EVs wouldn't cause extra pollution. Moreover, if new cars are produced at clean facilities, there will be very little pollution. With energy sourced from clean and safe facilities, emissions can be minimal. Furthermore, existing cars could be converted. As the EPA says, diesel emits more carbon dioxide per gallon (22.2 pounds) than gasoline (19.4 pounds). One may drive longer on a gallon of diesel, but apart from carbon dioxide there are particles included in diesel emissions that affect health and that act as a greenhouse gas. Furthermore, these particles end up on glaciers, ice and snow, causing it to melt, resulting in albedo change. Electric cars cause less emissions, even if the electricity came from coal-fired power plants. When cars drive on fossil fuel, only a small part of the energy actually powers the wheels, in the case of gasoline it's only 20%. Most of the fuel burned turns into heat. For a closer look at ways to compare how clean and efficient cars are, see the Automotive X Prize and the EPA references and the various EPA calculations to work things out. 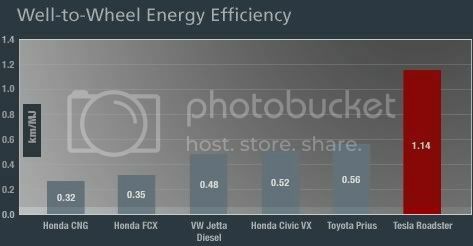 In the above image, Tesla uses distance (km) per megaJoule (MJ) to compare the efficiency of different cars. Note that the Tesla is built for speed and fast acceleration, there are many electric cars that drive further on the same electricity. Furthermore, a coal-fired power plant cannot be suddenly switched on or off, it takes a long time to power it up. Therefore, power plants commonly keep burning coal at night, just to keep the plant going, even when the energy is wasted. Thus, recharging EVs at night, when demand for electricity is low, will cause little or no extra emissions and can be done without requiring much additional infrastructure. Many will agree that an 80% reduction in CO2 emissions should be achieved by 2050. There's little chance of achieving such targets without EVs cleaning up transport, providing local storage for solar panels and grid storage to improve the grid and increase the potential for wind energy. Additionally, the risk of feedback effects rapidly accelerating global warming makes it important to also reduce short-lived pollutants. 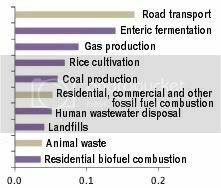 When looking at pollutants over a 20-year period, road transport tops the list in terms of RF (W/m2), as illustrated by the image on the left, further highlighting the importance of an immediate focus on the transport sector. Ethanol is not the best way to power cars. Farms that grow corn for ethanol use pesticides, fertilizers, energy, water and land, which drives up food prices and puts extra burdens on the environment. As a recent study points out, it would make more sense to convert biomass to electricity, rather than to ethanol. But of course, there are better ways to produce electricity, such as with solar or wind power, rather than by burning biomass. There are several safety issues related to electric vehicles, each of which can be dealt with adequately. Warning lights and sounds can make other road users more aware of electric vehicles, especially when reversing. Artificial engine sound can be added. Sensors and cameras can further be added to avoid collisions. Electrical hazards is another issue - electric vehicles have to comply with safety standards that require batteries to be adequately covered and insulated, to prevent people from accidental getting electric shocks. Some electric vehicles would not pass rigorous crash testing, but they are meant to be used as Neighborhood Electric Vehicles (NEVs). In many cities, NEVs are allowed to drive within certain boundaries; they don't have to comply with more rigid standards set for cars that drive at higher speeds on highways. As carbon fiber becomes more common, such NEVs will also become increasingly safe. Carbon fiber typically is much stronger and stiffer than steel, and last longer than metal because it is resistant to fatigue or corrosion. Furthermore, carbon fiber weighs less than comparable steel products, making it particularly attractive for use in car bodies, hoods, etc. In the electric Hi-Pa Drive™ Ford F-150, in-wheel motors are used. The Hi-Pa Drive system effectively replaces the mechanical drivetrain, axles, gearbox, transmission, differential, driveshafts and transfer case that would otherwise be necessary for a four-wheel drive truck. Furthermore, it replaces the engine, exhaust system, supporting subsystems and the fuel tank, freeing up space for a 40-kilowatt hour battery that sits under the chassis, under the rear part of the cab and the bed where the fuel tank normally sits. This means there's no loss of load space, in fact it creates more space under the hood. The many further parts that aren't needed in all-electric cars include starter motor, air filter, air intake manifold, fuel lines, fuel filters, fuel pumps, carburetors (or fuel injection system), water pump, coolant pipes, radiator, fans, motor oil tank, alternator and all kinds of sensors and management devices to monitor and control all this. Instead, there are in-wheel motors each with built-in control, and there is a battery pack, battery controller/management system, power inverter/charger system and associated wiring. This can make an all-electric car less heavy than a gasoline version, but the weight of electric cars much depends on the size of the battery pack. The display F-150 features a 40-kilowatt hour Lithium-ion battery pack, weighing roughly 1000 pounds and giving the truck a range of up to 100 miles. This range depends on how the truck is driven. Highway driving will give it a smaller range than urban driving, as the Hi-Pa Drive system acts as a generator, recapturing kinetic energy during braking. Apart from this regenerative braking, the hydraulic friction brakes are retained in the truck, for additional braking capability. Yes, there is support, but not enough. There still is too much support for the fossil fuel industries, but that situation will not continue. There will be a an increasing amount of support for EVs in future. Government at all levels support electric vehicles with tax deductions, subsidies, rebates, free parking and recharging facilities and more. There are similar documents at the Altairnano site. 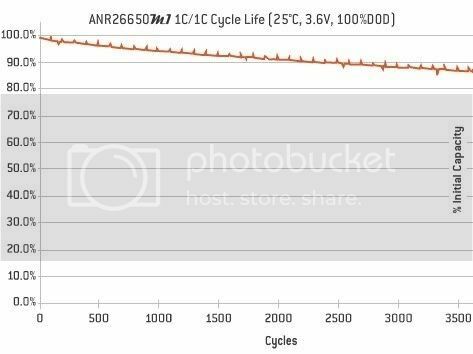 According to this document, the Altairnano NanoSafe battery cells have in laboratory testing achieved over 9,000 charge and discharge cycles at charge and discharge rates up to 40 times greater than are typical of common batteries, while retaining up to 85% charge capacity. Toshiba has announced batteries for applications including EVs, with characteristics such as long life with minimal capacity loss even after 6,000 charge-discharge cycles and rapid charging capability with ability to charge 90% of the capacity in as fast as 5 minutes. Both the Nissan Leaf and the GM Volt come with an eight-year/100,000-mile warranty on their lithium-ion batteries. Battery manufacturers have put a lot of attention into this issue and much work has gone into the production of separators and other safeguards to prevent overheating. The risk seems minimal compared to the risk of fuel stored in vehicles with internal combustion engines catching fire, or of their fuel tanks exploding in case of fire. 16. Can the power grid cope with the extra demand of EVs? As Rob Pratt pointed out in his June 2007 workshop, idle capacity in the U.S. grid could supply 73% of the energy needs of today's cars, SUVs, pickup trucks and vans, without adding generation or transmission, if vehicles are charged at off peak hours. Pacific Gas and Electric Company has off-peak rates (in summer, midnight to 7.00 am) as low as $0.05/kwh, while peak rates are as high as $0.28/kwh. Such Time of Use (TOU) rates are a great incentive for owners of electric vehicles to recharge at off-peak hours from the grid and from rooftop solar panels at peak hours. There's further synergy between rooftop solar panels and electric cars, which makes that a shift to electric vehicles (EVs) goes hand in hand with more solar panels. Owners of EVs are more likely than other vehicle owners to add solar panels and wind turbines on their premises. In a survey of RAV4-owners, 48% responded that solar energy powered their car. Storing electricity from rooftop solar panels in car batteries during the day can deliver electricity to households in the evening. Retailers, offices and parking lot owners have an opportunity to provide extra service to customers and staff with EVs, if they install solar panels on the roofs of their premises and car covers, and allow EVs to be recharged during the day. Such recharging from solar panels can take place without putting stress on the grid. Once returned home, EV owners could then use surplus electricity at home, or sell it to the grid, thus helping the grid cope with the evening peak. This becomes even more apparent with wind energy. Typically, more wind blows at night, when demand for electricity is low. As more wind turbines get installed, it makes ever more sense to store a nightly surplus that would otherwise go to waste. When recharged at night, EVs store such surplus electricity in their batteries. This battery power can be used for day time driving, to power the home, or to feed electricity back into the grid at times of peak demand. Such V2G (Vehicle to Grid) is facilitated by smart meters that collect real time data of electricity consumption and electricity fed into the grid (as opposed to aggregate data), and by a charging structure that has low rates at night, and high rates at peak times (both for electricity consumed from the grid and for electricity fed into the grid). Floating rates would allow supply and demand to set the rates in real time, while government could further facilitate the shift to clean energy by imposing fees on fossil fuel that fund rebates on clean energy. In conclusion, rather than being a burden to the grid, EVs can help the grid better cope with demand, they make the grid more reliable and robust, acting as emergency power supplies. EVs help the grid shift from fossil fuel-based power plants to clean and safe technologies, such as solar and wind energy. This would not only make the grid cleaner, it would also make it less vulnerable to outages, glitches, load balancing problems and terrorist attacks. Instead of a burden, EVs are part of the solution. Recharging electric cars can be done at night and can be as easy as (dis)connecting the car to or from a charger in one's garage. In terms of convenience, this compares well to getting fuel. Charging an electric car can take place pretty much automatically, whereas a substantial amount of time, effort and attention needs to be devoted to finding a gas station, queuing up, filling up and making the associated payment. Similarly, electric cars require very little maintenance and servicing. Recharging electric cars could be even easier with contactless charging. In 2009, Nissan unveiled an electromagnetic induction plate. To recharge, an electric vehicle merely needs to be parked at a spot with such a plate. In case of power grid failures or outages, the battery packs in electric cars could also power homes. A book about the history of electric cars describes that electric cars have been around for more than a century. It tells how sellers in the past touted the electric car's easy operation and maintenance, pointing out that electric cars were "safe, silent and free from offensive odors, smoke and grease". And how one electric car manufacturer praised the electric motor as "clean, silent, free from vibrations, thoroughly reliable, easy of control, and produces no dirt or odor". Electric cars are not a novelty, they have been around for longer than gasoline cars. In 1895, an electric car won the very first auto race in America. In 1899, an electric vehicle called La Jamais Contente, set a world record for land speed of about 66 mph. Around 1900, more electric cars were sold than gasoline cars. Moreover, the need to act on global warming makes that gasoline cars have got to go and that electric vehicles are the way of the future. The Better Place model simply doesn't work in a vast, low populated place like Western Australia. Long distances with no towns, no rail, no airports - there is currently no alternative to fossil fuel vehicles. Example - Katherine NT to Kununurra WA is over 600km - 1 small settlement about ½ way - nothing else. Better Place's solution could not possibly work - economically not viable, too big a distance (you'd at least 4 switching stations) + the total lack of electric grid & not enough vehicles travelling each day. That is only 1 example of 1 highway - plenty of others like throughout the outback. There is no explanation of how - outside of densely populated regions, electric vehicles could possibly replace fossil fuels. People in low-populated, off-grid locations can benefit a lot from solar panels and electric vehicles. They now need to travel a lot to buy fuel for their vehicles, their generators, their heaters, etc; they'll spend a lot of money on fuel and the servicing of vehicles and equipment. Compare this with the cost of having solar panels, recharging batteries on site for use in vehicles when needed. When traveling long distances, multiple batteries could be used. Hydrogen is another alternative. Such alternatives are coming down in cost, and they can be attractive both financially, as well as in terms of safety, reliability and maintenance requirements. Cost of gasoline and other fuel, on the other hand, is going up, and Australia's carbon pricing is just one of the reasons why. Again, in case of off-grid locations, batteries could both power vehicles and provide power, heating and air-conditioning for buildings. Australia has taken a move in the right direction with carbon pricing and the financial support this can provide to clean alternatives. Australia also has a lot of sun, so I have high expectations for such alternatives there.